Why the Indian government is scared of an iPhone app! Indian security agencies have just one more thing to do before they crack Blackberry and Nokia’s email server problem. An iPhone app! Tiger Text is an iPhone app which is getting Indian security agencies attention. Tiger Text is a cunning little app, the intended usage has more bad ways than good. Tiger Text can delete a text message sent or a phone call made from the history of the receiver. The sender controls what he sends – something which isn’t possible by default. This can be used for umpteen purposes and the best purpose anyone can think of right away is philandering. Not so fast cowboys, there’s a catch. The app will work if the receiver also has the app and obviously an iPhone. Philandering can be of mutual consent and one can get through the mutual installation quite easily. And philanderers are not Indian security agencies problem. It’s the terrorists who can use this app at will to send messages without leaving any trace behind. For Blackberry the messages are encrypted but they are still there somewhere. 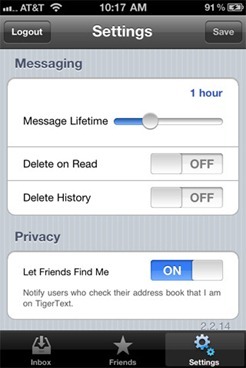 In the case of Tiger Text, the messages are deleted and there is absolutely no trace. Government cannot obviously deal with X Sigma Partners LLC, the maker of the app, because the company doesn’t have any operations in India like Blackberry (RIM). Government is taking the next best route, it’s asking the service providers (read telcos) to make sure they keep track of the data before they roll out this app. Unfortunately this isn’t an easy option. How can Airtel stop anyone from downloading an app? My guess it cannot. Even it can, it will not have the motivation to take care of just one app. Government can instead request Apple to make this app unavailable in the country. Hei, I am not giving any ideas, this should have been the first option given our government’s track record. Until then, download the app, text’em, call’em guilt free. Do what now? I told you the app exists, and you want a link too?